Media tablet sales are set to grow from 17.6 million last year to 326.3 million in 2015, and the bulk of them will continue to be Apple iPads(s aapl). 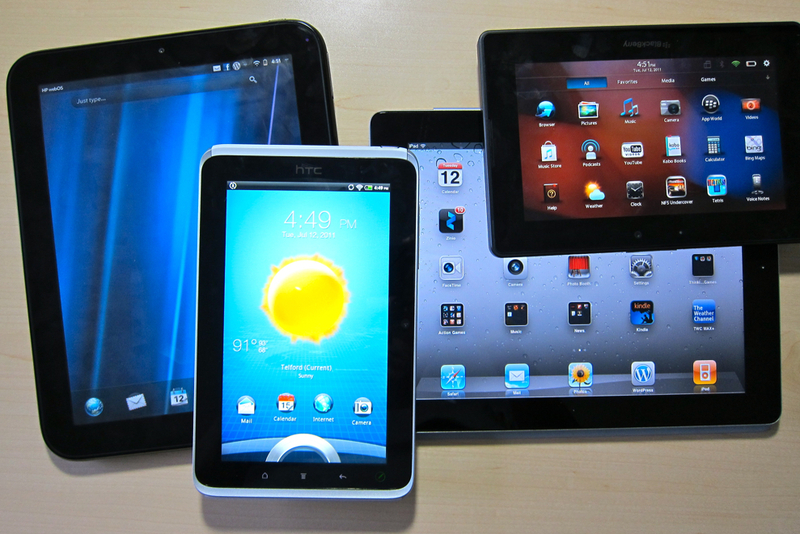 So says Gartner, (s it) which on Thursday put forth a four-year estimate of tablet sales by operating system. The numbers reflect that Apple has a large head start with a mature tablet, as all other competitors are still struggling to catch up. That premise doesn’t surprise, but Gartner’s projected growth of QNX-powered tablets does. Even over the next four years, as competing tablets and their supporting ecosystems mature, Gartner projects Apple’s iPad will hold a majority share of all tablets sales over the next four years. Android will continue to chase for the No. 2 spot but still manage just over a third of market share by 2015, while QNX(s rimm) and Microsoft(s msft) slates bring up the rear. HP (s hpq) is considered to be out of the game completely due to abandoning the TouchPad hardware business with a massive inventory fire-sale. I think there’s a very slim chance that situation reverses itself due to speculation of HP replacing its current CEO, Leo Apotheker. A few thoughts jump to mind. First, I don’t doubt Apple’s dominance in the tablet market throughout the next few years. If anything, I think it’s understated by the estimates. That’s not to say the iPad is the best tablet for everyone, but it currently has the broadest customer appeal and most mature ecosystem for applications and services. Apple gave itself a good 18-month lead in the market and others are still scrambling to offer a fully comparable tablet experience. I also wonder how Amazon’s(s amzn) upcoming tablet plays into the estimates as we already know the device is based on Android, even if it’s heavily customized so as to hide Google’s interface. The same holds true for the popular and extensible Barnes & Noble Nook Color(s bks), which ought to see a hardware refresh in the near future. I suspect that with weak sales of traditional Android tablets, these combination e-readers / tablets will make up the bulk of Android tablet sales, but Gartner makes no comment on that aspect. Then there’s QNX. Earlier this week, I noted that Research In Motion (s rimm) shipped a scant 200,000 PlayBook tablets with QNX in the most recent quarter. That figure follows an estimated 500,000 PlayBooks shipped in the quarter prior to that. The data reflects shipped PlayBooks, not actual sales, and even if they were sales, I don’t see how Gartner expects RIM to sell 3 million PlayBooks this year. Even with a software update to add native email and support for Android applications, it appears impossible that RIM will sell 2.3 million tablets or more between now and the end of 2011. It’s too early to call out any numbers for Microsoft (s msft) tablets, although a touch-friendly Metro interface and ARM (s armh) processor support for Windows 8 gets Microsoft in the game. Gartner expects a reasonably quick uptake once Windows tablets arrive, but I’ll wait and see the final product before taking a stab at sales. Regardless, the iPad is still the once and future king of tablets; at least for the next few years. Gartner classifies all Windows 7 devices as either PC or tablet PC, so is this tablet with Windows 8 without a keypad only? With Win8 being on a myriad of form factors, this will get all the more confusing. Exeption of the Nike MAGs becoming self lacing, no one should claim what a product will do or how much competition there will by 2015. It too presumptuous and tech trends change so frequently that it’s a pure guess. Apple also had a huge head start in smartphone. Then Android came out and surpassed iPhone in no time at all. Nobody saw that coming. It’s naive to think that Apple will remain dominant in tablets 4 years into the future just because it has a head start. They must not be counting current microsoft tablet slates (which they do sell) and are big in some vertical markets. I can’t see how their total is somehow ZERO. Their forecast is very suspect. In 4 years windows 8 might have many more millions than apple iOS if the platform and tablets are adopted by businesses. Perhaps Slates with keyboards will replace laptops and that would mean a huge increase in Microsoft Tablets. Correct: Tablet PCs are exclusive from consumer tablets as measured by most folks these days. I would agree with the distinction because it’s likely that Apple has already sold more iPads since last April than Windows Tablet PCs have sold in the past decade. Android is a Google trademark isn’t it? If devices like the Nook or Kindle have nothing on (or about) them that identifies as Google/Android, are they really android-based devices? What’s the real OS, Linux/Java isn’t it. Seems to me, there’s nothing “android” about them. Do we refer to our cars as being xxOS-based? No. The embeded system is unknown and nobody cares. I see your point, but take a look at how people are using the Nook Color. It’s a simple matter to run the native Android interface as needed and turn the device into an inexpensive but quite capable Android tablet. That’s why some buy the device: because it is an Android tablet. Even in its out of the box state, the device runs Android apps from from the B&N Nook app store. The same could be true of Amazon’s tablet (we don’t know yet): it may run standard Android apps from Amazon’s AppStore. Apps are an important part of any tablet experience and if both of these run Android apps, that’s key IMO. Yes, if they run “standard” android apps I suppose. What part of these types of devices are “android” vs “linux/java”? Are the apps “android” or are they “java” apps? I know it makes it easier for you guys to clump everything that even resembles “android” together (and makes android look better too) but is that actually reality?